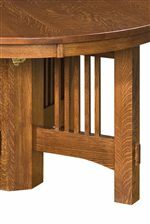 Fit for intimate family dinners or large holiday feasts, this expandable table is the best of both function and fashion. Its warm, casual design features a round Mission edge top with detailed legs that come together in the center. 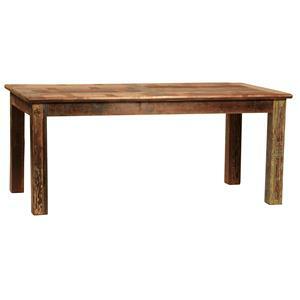 Classic and casual, this dining table will complete your dining experience. The Heartland 48" Round Expandable Dining Leg Table by Amish Impressions by Fusion Designs at Williams & Kay in the Anchorage, Mat-Su Valley, Eagle River, Alaska area. Product availability may vary. Contact us for the most current availability on this product. Description: Top Solid wood tops are used for a sturdy, solid finished product. 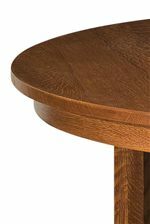 Table top shapes range from oval, square, square with rounded corners, round, tapered and boat shape. 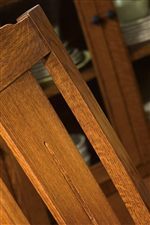 A casual, yet classic set for your kitchenette or dining room, the Heartland collection exudes a warm, welcoming vibe that will make anyone feel right at home. With quality construction, skilled artistry and a work ethic instilled by generations of Amish craftsmen, Heartland has the customizable look and hand-crafted construction you are looking for. With the ability to expand the table to up to 6 leaves, Heartland can transform your dining area from intimate family dinners to large holiday gatherings. Create lasting memories over food and drink with the homey Heartland dining collection. The Heartland collection is a great option if you are looking for Casual furniture in the Anchorage, Mat-Su Valley, Eagle River, Alaska area. Browse other items in the Heartland collection from Williams & Kay in the Anchorage, Mat-Su Valley, Eagle River, Alaska area.